What Are The Laws Regarding Direct Access? Have you considered physical therapy, but are unable to require a doctor’s prescription to attend? Or perhaps you’re not looking to stress yourself through the hassle of contacting multiple physicians to obtain a referral. With direct access, this entire process is expedited, allowing patients to save themselves time and effort. Direct access is legally advocated in every state in the U.S. (as of January 2015). However, certain jurisdictions may place limitations on allowing direct access for physical therapy. Fortunately, the state of New York falls under the category of “patient access with provisions” meaning that direct access is allowed. Although, it may have minor limitations such as a maximum number of visits or referral requirements for specific treatments. That being said, you can seek out direct access physical therapy in Farmingdale, NY at our facility, as we meet the qualifications for offering this service to our patients! What Benefits Come From Direct Access? Forming quick and easy relationships with your physical therapist. Potential to spend less money, no need to visit your doctor and add to your bills. Direct, usually one to one, communication between the patient and the physical therapist. Less of a need for branching out to other physicians. No obstacles to clear! If you want physical therapy, you can go out and get it. 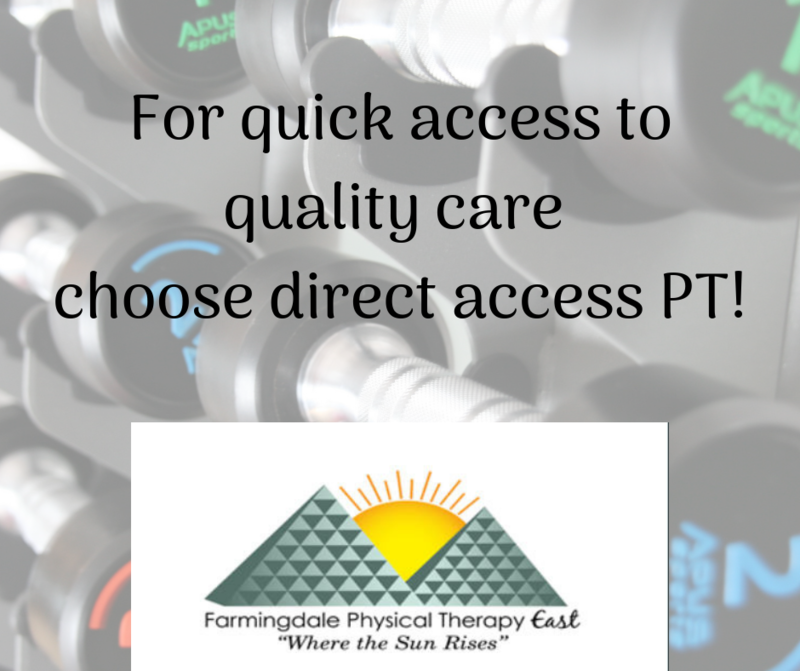 If you’re injured and need direct access to physical therapy in Farmingdale, NY; contact the office of Farmingdale PTE today and ask about our direct access program! This entry was posted in Uncategorized and tagged physical therapy in Farmingdale NY. Bookmark the permalink.